A decade ago Wayne Snell was in the software industry. He was making a comfortable 6 figure salary, and had a nice job title. Yet, that still required putting in 80+ hours a week, and just being stuck on the hamster wheel. Today, Wayne has around 300 real estate and mortgage note assets under management in 17 states, and never has to clock in on the job site. Of course, it wasn’t as easy of a transition as he expected, despite getting a big payout on selling his software company. So, what challenges can you expect to face on the journey to succeeding in the non-performing note space? 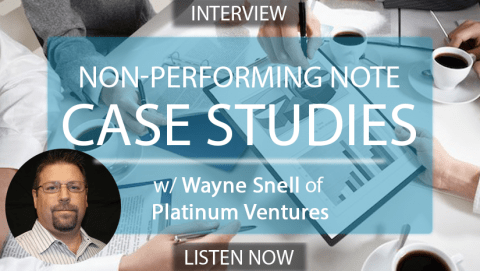 How is Platinum Ventures navigating the market now? Wayne could have started out with a serious head start. He successfully sold his previous company to IBM. Unfortunately, his first venture into real estate, through a REIT saw him lose 7 figures to a major Ponzi scheme. Refusing to give up, he began venturing into direct investment in real estate. Being located in Dallas, TX, that soon became very challenging as home prices began rebounding, and the math wasn’t adding up to make new acquisitions. Wayne stumbled on note investing as a property acquisition strategy. Then he realized how much easier being the bank was, and began converting his model to focus on notes to get cash flow, without the hassles of having tenants. On one of his first deals he was tested again, as the borrower held out until the sheriff had to forcibly evict them. Now Platinum Ventures goes into every potential deal with at least 3 exit strategies modeled. While it isn’t the firm’s most desired course of action Wayne says that even going through with a foreclosure has a way of turning negativity into positivity, as homes and neighborhoods are made more productive. Sorry, this audio has gone into the vault. See what’s included with a DistressedPro membership. I am learning so much from these interviews. Thank you.